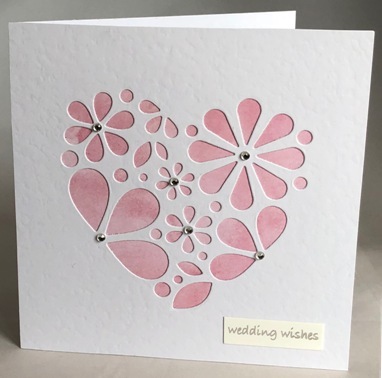 I have die cut this heart of daisies from white card and have back mounted it with watercolour patterned paper in a pale pink paper. This is then attached to the card itself so that the patterned paper is not seen from the inside. Some of the daisies are embellished with clear acrylic gemstones. Wedding Wishes is written on a banner at the foot of the card in silver lettering.The card is blank inside for your own greeting. If ordering by phone, please reference card #778.